Here is the official Massenomics review of the ShouldeRok made by Chris Duffin. We took a look at the quality of the product, as well as its usefulness. Massenomics is in no way affiliated with Chris Duffin or Kabuki Strength, so rest assured this review is straight from the heart. This product review does not serve as a full tutorial on how to properly use or implement the ShouldeRok into your training. Duffin already has that covered. Go to KabukiStrength.net to check out all of his info and to purchase your own. The ShouldeRok is the brainchild of powerlifting great Chris Duffin. This tool can be utilized by all types of athletes. For Massenomics' purposes we looked specifically at the benefits for strength athletes in powerlifting, CrossFit, and strongman sports. 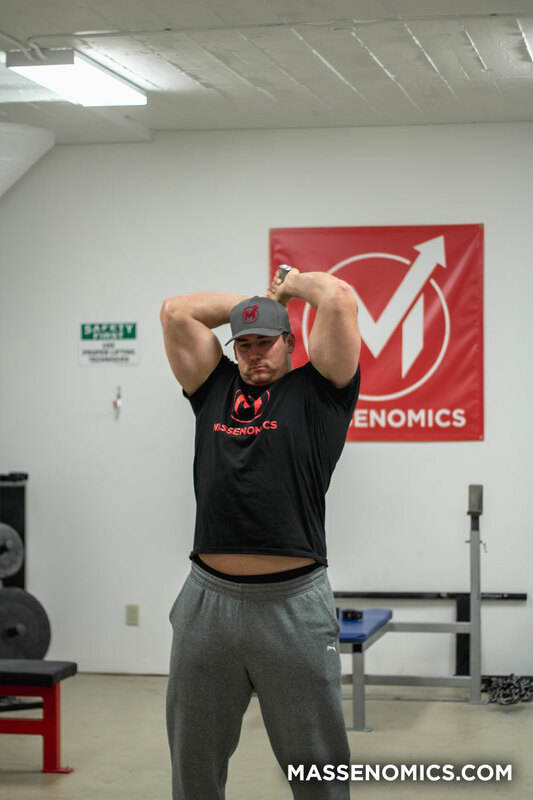 Duffin says that "when it is used correctly it will increase strength, mobility, and continuously reinforce your need for core stabilization." It can improve shoulder mobility for lifters with years of wear and tear on their bodies. The breathing and bracing that is required to correctly use the ShouldeRok ensures a stable neutral spinal position that has direct carry over to moving heavy weights safely in the gym. If you've never seen one in action, the gist of it is as follows: The ShouldeRok is held with both hands and swung around your head. It reaches close to the ground in the bottom position behind your body, and sticks straight up in the front position. When you purchase one, Duffin provides you with helpful tutorials that show the proper progression as you learn. There are other variations that you can implement into your training as you become more comfortable. Check out the brief video below to see one in use at Massenomics Gym. The ShouldeRok is similar to other training maces that are available from other companies, but there are a few key differences. Probably the most notable of which is that the ShouldeRok is adjustable. It can be loaded to any weight desired by the user. That makes it so lifters of all different strength and skill levels can utilize one implement. It's also beneficial to be able to change the load for programming and progression purposes. We found that our favorite time to put the ShouldeRok to use was pre-workout as a part of our warm-up. Our favorite days to use it were prior to any pressing movements and prior to squatting. Swinging the Rok probably won't, and shouldn't, completely replace your warm-up routine prior to the main compound movements, but it's certainly a valuable addition. We've also noticed a positive effect from utilizing it at the end of heavy pressing workouts. Sometimes that's the last thing you feel like doing after a big workout, but it's a good way to get out in front of the recovery process. Duffin recommends using the ShouldeRok three times per week to see the greatest benefit. We found we couldn't really use it too often. That's not necessarily a suggestion to use it 365 days a year, but don't be afraid to use it multiple times every week. Your shoulders will thank you for it. It is likely you won't have the hang of the ShouldeRok the very first time you pick it up. Our advice is to first watch the instructional videos that Kabuki Strength provides links for when you purchase one. Work through the progressions that Duffin suggests. Don't get discouraged if you smack the backs of your legs a time or two. 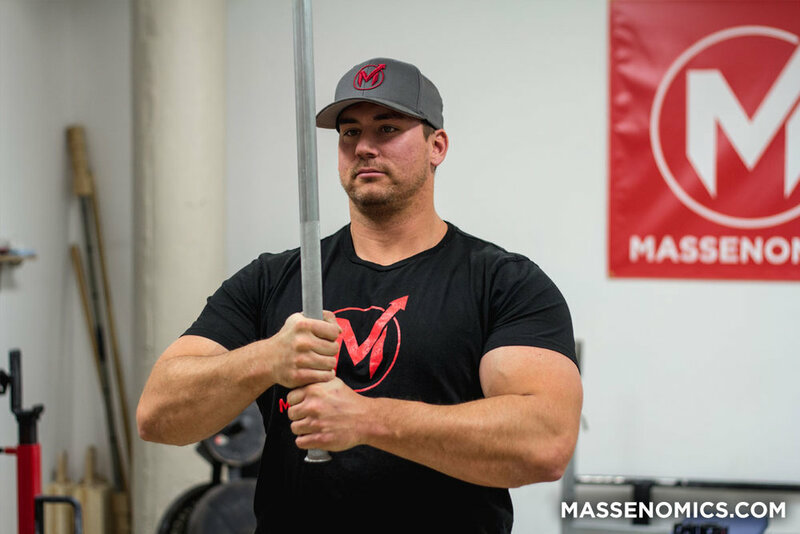 Most lifters that used the ShouldeRok at Massenomics Gym had it down pretty well by their third session training with it. Once you get the hang of it, you will really start to notice the benefit. Swinging the ShouldeRok has an immediate effect of "opening" up your shoulders. Duffin does a good job of explaining the mechanics behind that, but we just know it makes you feel better. When done properly the core stabilization and breathing reinforcement are also noticed with the first use. The craftsmanship has to get the highest mark our official Massenomics' scale allows. It's not the most complex piece of equipment ever made, but you can tell every part of it was designed and manufactured with a purpose in mind. 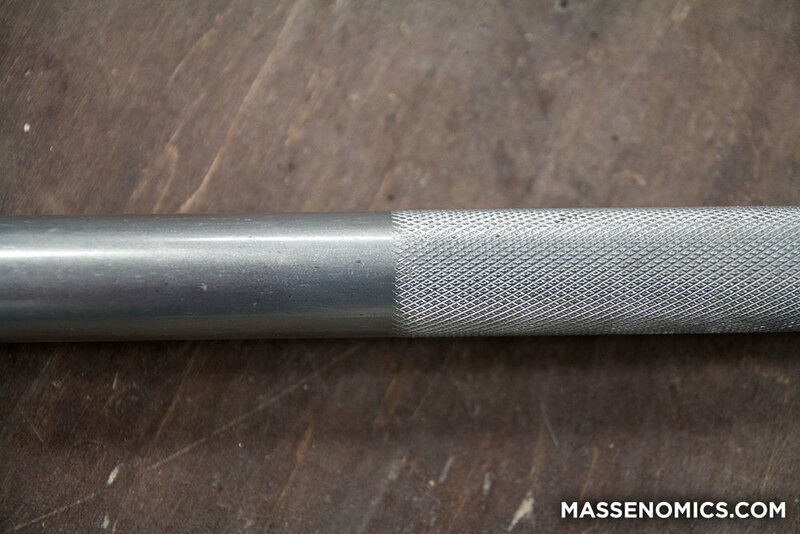 The beveled end and the knurling that you see in the picture above are both done very well. Those features allow you to swing substantial weights without worrying about accidentally setting any new hammer toss distance records. The large threading and lock down collar work smoothly together. 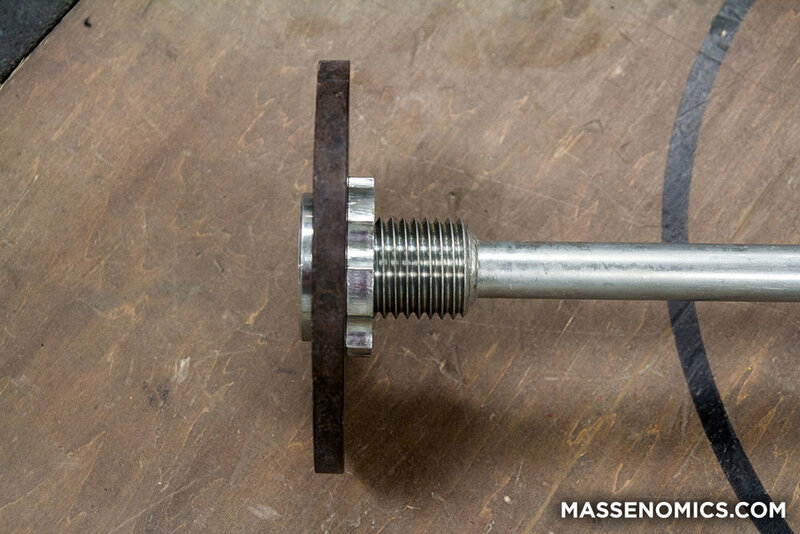 Once the nut is tightened down, there is no worry of the weight shifting. Watch that action in the video at the beginning of the article. Quite honestly with the nature of this product and what you do with it, it has to be made well. If it wasn't, it would be about as dangerous as hammering dynamite. Thankfully, Kabuki Strength did their job well and made a safe functional product. Chris Duffin doesn't put out gimmick products just to make another dollar. He is one of the most respected strength coaches in the industry. You don't have to listen to him long to understand that he is a movement expert. He is big on reinforcing natural movement patterns while keeping strength development as a primary focus. All the equipment he designs has evidence-based proof that it can be effective. He has an engineering background, so he's able to take an educated hands-on approach in the development and manufacturing processes. This unique skill set combination allowed Chris to bring to us one of the industry's most sincere products in the ShouldeRok. Don't go too light when you start out. Most men are going to need at least five pounds loaded in order to even move correctly. Put safety first when ShouldeRoking. Take an extra ten seconds to do a 360 scan every time before you start swinging. Nobody wants to be on the business end of a mace. Have fun with this tool and your training. Explore different challenging variations of the movement as you become more comfortable. By now you know we don't have anything but positives to say about the ShouldeRok. It's a well made, highly functional, unique training tool that can play a role in improving your performance in the gym and on the platform. Leave us a message and let us know if you've trained with one before, and what your opinions are. Massenomics has more product reviews like this in the pipeline. If you enjoyed this one, check out our BowTie Review. Like us on Facebook and subscribe to our YouTube channel to stay in the loop. You can also subscribe to our newsletter at the bottom of the page. We discuss all things lifting on our weekly podcast and we try to put protein powder on our table at home with sales from our apparel shop. Give your beginner-self one piece of advice.